Weather continues to be calm and sunny. The snowpack has gotten more stable since the last storm. However, the possibility still exists to trigger deep slab avalanches up to 5 feet deep in terrain over 35 degrees. A MODERATE danger can be found in areas above treeline in steep terrain. The likelihood of triggering a deep slab pocket is low, but the consequences to your health would be significant. Below treeline the danger is LOW. It has been 5 days since we have had reports of major avalanche activity. This is a good sign, as time goes on people are getting on increasingly agressive slopes and the snowpack is trending towards stable. Anyone riding in big, steep terrain must understand the possibility of a large avalanche still exists. The slab/weak layer combination that caused the big avalanches last weekend is still present. Both the slab and weak layer have gained strength over time, making it more difficult to trigger this problem. But remember, this isn't our typical snow year. The snowpack is shallow, and multiple crust layers have led to persistent weaknesses. Click here for a writeup of the big avalanche in Seattle creek last weekend. Steep terrain should be approached with a conservative mindset. Ask yourself, "What would happen if this slope avalanched?" Cornices are as big as we've seen them this year. The photo is from last week of a section that dropped spontaneously, triggering a slab on the slope below. 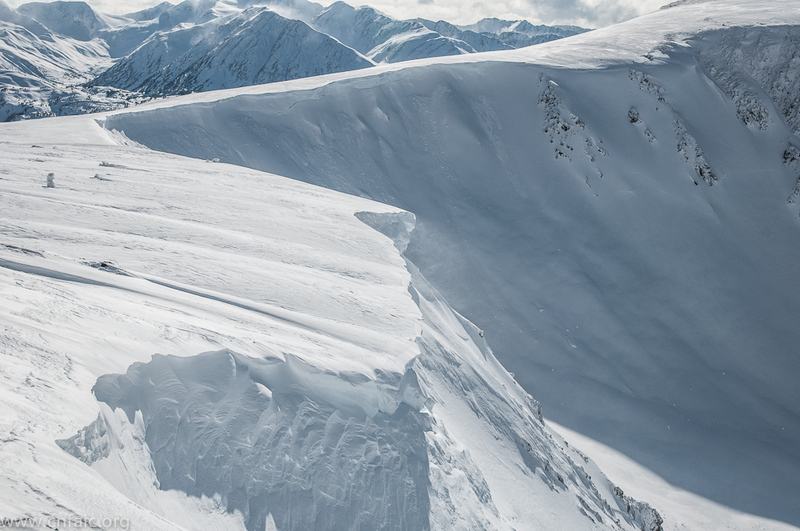 Check out this video for a good perspective of a close call with a cornice. Perfect March weather would be accurate for the last few days. Sunny skies, minimal wind, and comfortable temperatures. Today will bring more of the same. Some clouds will roll in by the afternoon. Wind will be calm, and temperatures rising with the sun exposure. For the long-term, we don't see any significant storms from now through the weekend. A ridge across mainland Alaska is keeping the low pressure at bay.